900 lumens with 16 aperture stops Different rooms have different requirements for your projector's brightness. On top of that, some requirements change depending on the time of day. The JVC DLA-RS20's new aperture system supports sixteen settings and up to 900 true ANSI lumens for the ultimate in performance and flexibility. Combine this with the ambient-light-rejecting properties of the Stewart FireHawk screen and you have a projector you can use in almost any room! 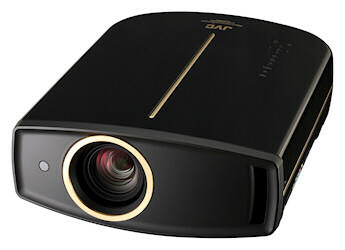 50,000:1 Native Contrast Ratio This new 1080p D-ILA projector boasts an amazing 50,000:1 native contrast ratio without a variable iris. This is one of the single most important features of a projector in determining how well it can recreate life-like pictures. We'll explain more about this below. Motorized Zoom Lens While previous models had manual zoom and focus the new RS20's motorized zoom makes initial setup and later tweaking a breeze. And the up-to-80% vertical offset means your new projector can hug the ceiling and display an image that's in the perfect position. HQV Reon-VX Processor The DLA-RS20 incorporates HQV's latest video processor to give you the best picture possible, regardless of the source. It removes "jaggies" and other picture artifacts as well as reducing noise on an image caused by compression. This part also makes older standard definition pictures look much better with 1080p upscaling (or upconverting). THX Certified The RS20 is THX Certified to guarantee the best picture quality available in a home theater projector. The THX Movie Mode has pre-calibrated settings for watching HD movies and TV, Blu-ray discs and DVDs which recreate in your home the same environment used in the movie's post-production. Those are just a few of the new features on the JVC RS20. Other include a new smaller chassis with automatic lens cover, on-screen customized gamma control to choose your favorite brightness level, improved color filters to accurately render lifelike images and external triggers for screen and anamorphic lens control. In addition to the other great improvements, the DLA-RS20 has anamorphic scaling modes. That means you can use a Panamorph lens system to get rid of those annoying black bars and experience the full impact of True Widescreen 2.35:1 movies. This is the most impressive movie-watching experience you'll ever have. After being immersed in a 2.35:1 movie, you'll never want to watch them any other way! While contrast may be one of the most important parts of an image, color accuracy is too. The DLA-RS20 comes from JVC's Professional Product division and is calibrated at the factory to the industry's color standard. That means your new projector will have natural-looking skin tones in your favorite movies and grass that looks real when your're watching the big game.